This will be the quickest, most minuscule of posts from me. Like you no doubt, this week and next see me hither and thither as a whirling dervish of activity. All pleasant, but frenzied nonetheless. Today, for example, was spent cooking and catering for a party at work, accompanying an elderly lady to a Christmas Carol party for people with dementia, getting lost twice in the car (once was definitely Google map’s fault! ), and now out to a late supper with Mr A’s parents. This will probably sound lame to some of you, but to little old homebody me it is busy enough. But I did want to just pass along my Fresh Cranberry Vinaigrette to you, in case you were stumped for jazzy ways to perk up any leafy greens or salads that might cross your path over the next week or two. 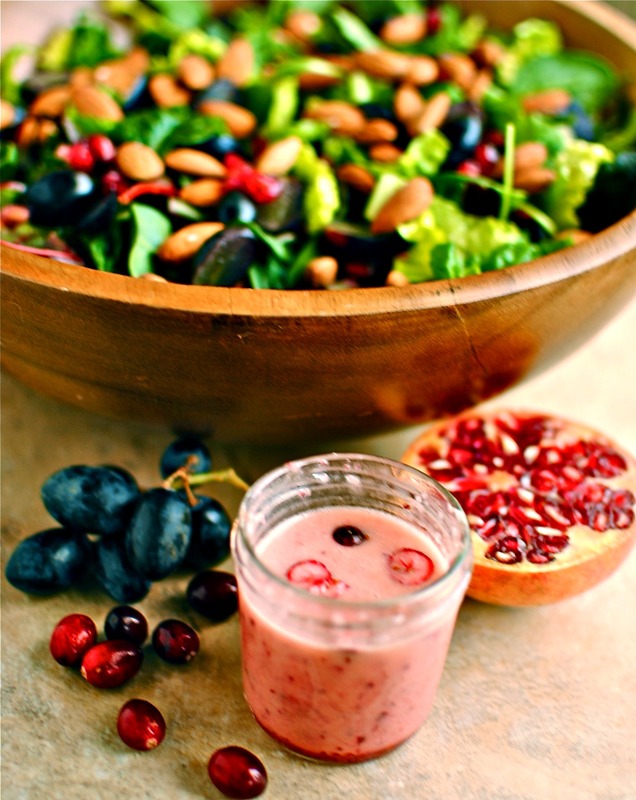 I have served this at work on seasonal mixed leaves that have had either pomegranate arils, black grapes, and toasted whole almond on top (pictured), and with cross-cut clementines, dried sour cherries, toasted seeds and avocado. At home we like a luxury non-vegan salad of sliced pear, pomegranate arils, freshly crumbled Roquefort cheese and toasted walnuts. Simple stuff to act as a lovely sharp foil to richer foods. Green salads are just the start though: what about massaging it into some chopped kale leaves, in a coleslaw (instead of the dressing I put in this recipe), or even to drizzle over a leftover turkey/ham pie? I will make sure to keep a jam jar of this vinaigrette on standby for those inevitable times when a restorative whole-food salad is in order. 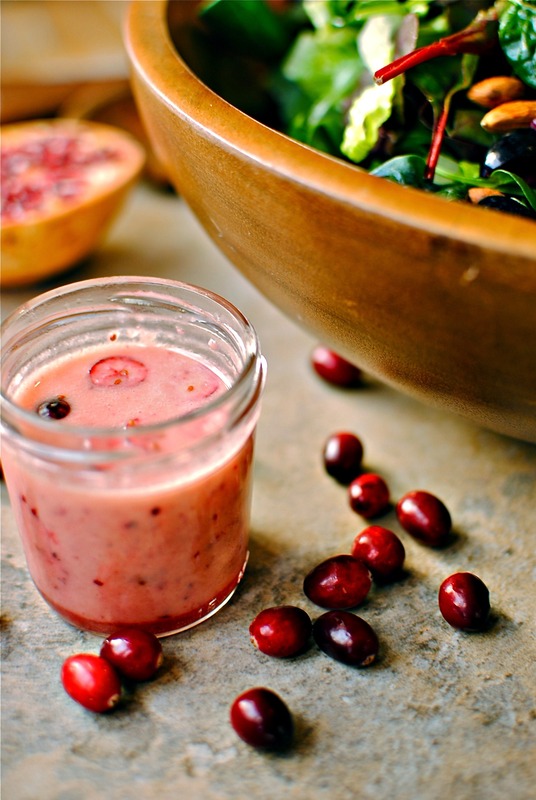 Dress your winter leaves in this pretty pink dressing made with fresh cranberries. Use fruit vinegar if you have it, or apple cider vinegar. I prefer a neutral oil like rapeseed rather than olive oil here – let the cranberries be the star. If you like, substitute 2 of the tablespoons of rapeseed oil/canola oil for walnut oil. 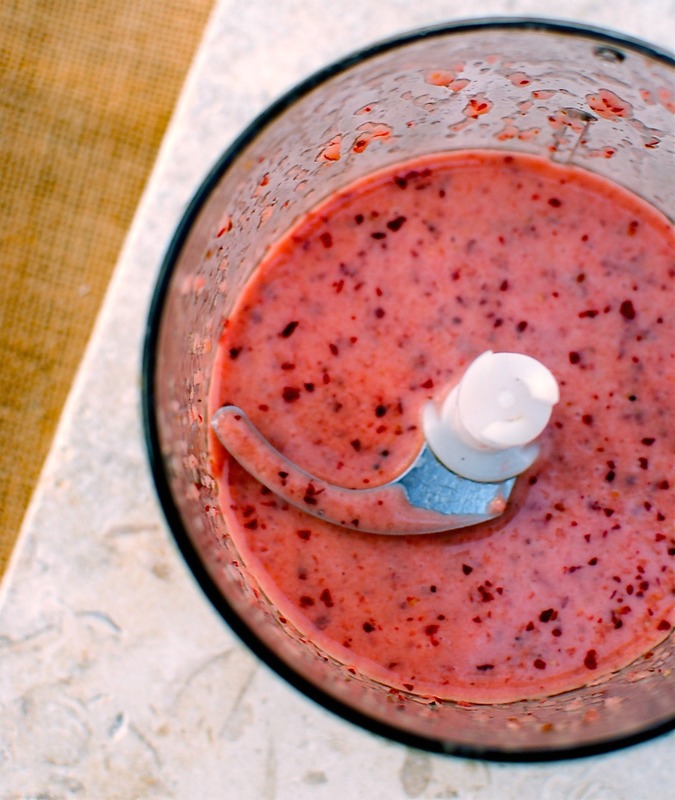 Put all of the ingredients in a blender or food processor and blend until smooth. There will be tiny bits of red skin but they look pretty! Wow! That salad looks beautiful and so vibrant. I bet it’s amazing with the vinaigrette. You take some amazing shots ma’am. I would buy a calendar if you ever made one :). 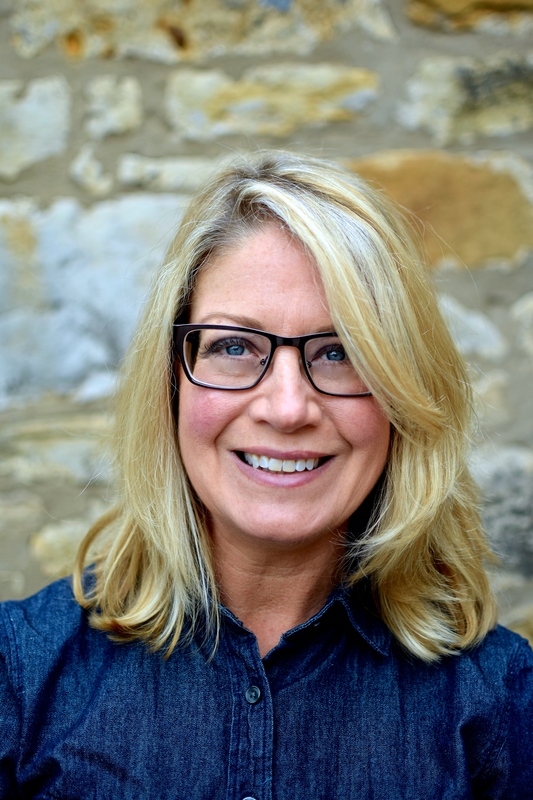 It would be a great way for your clients to keep track of everything in the chaos whilst being able to indulge themselves in some seriously blissful images whenever they headed over to the “organisational side”. I won’t be making this dressing. Not because I wouldn’t love to, but it just wouldn’t go with anything we have on our Christmas table. All cold food as it’s stinking hot here and the cicada’s have taken up permanent residence in the trees and are all clicking in the new seasons heat. Just try to imagine summer in the middle of Christmas and that’s what we have but at least a cold beer tastes good on the day, gotta give us something! ;). 😉 Enjoy that beer or two. Calendar is a good idea, but you must realise by now that I am far too lazy to organise such a thing. Knowing me I would accidentally make it a 2013 one! This is a wonderful dressing and your salad is gorgeous too. Happy Holidays and Merry Christmas. This is a wonderful seasonal salad. I make mine with reduced cranberry juice – but this is much prettier. And healthier, I imagine! Thanks for the inspiration! wow that is the most beautiful dressing I have ever seen! Nice close ups of that lovely salad. Happy Holidays! A great way to use a bit of leftover cranberry sauce too! Sounds delicious after holidays full of sugar and rich foods. Yes, leftover cranberry sauce (especially homemade and fairly nippy) would be great in this. Thanks for commenting. Nice looking dressing. I’ll have to wait until I complete Whole30 to give it a try.